High activity of immunosuppressive cells in the tumor microenvironment (TME) is frequently found in patients who are nonresponders to different forms of immunotherapy, treatments which can demonstrate long-term benefits in the subset of patients who do respond. In a recent paper published in Cell, Tavazoie et al. aimed to elucidate the mechanism by which liver-x nuclear receptorβ (LXRβ) agonism and ApoE, a secreted protein with inflammatory and anti-inflammatory properties, reduced melanoma progression and metastasis. Unexpectedly, they found that the target of LXR agonism and ApoE activity were immunosuppressive myeloid derived suppressor cells (MDSCs). Both RGX-104 and the less potent GW3965 are LXRβ agonists that regulate cholesterol and lipid metabolism and drive the transcription of ApoE. Expanding on their earlier work in melanoma, Tavazoie et al. demonstrated that oral administration of either compound suppressed tumor growth in murine models of a wide variety of cancers. They also observed that treating syngeneic MC38 colon cancer tumors with RGX-104 was more effective in immunocompetent models than in immunodeficient (NSG) mice. 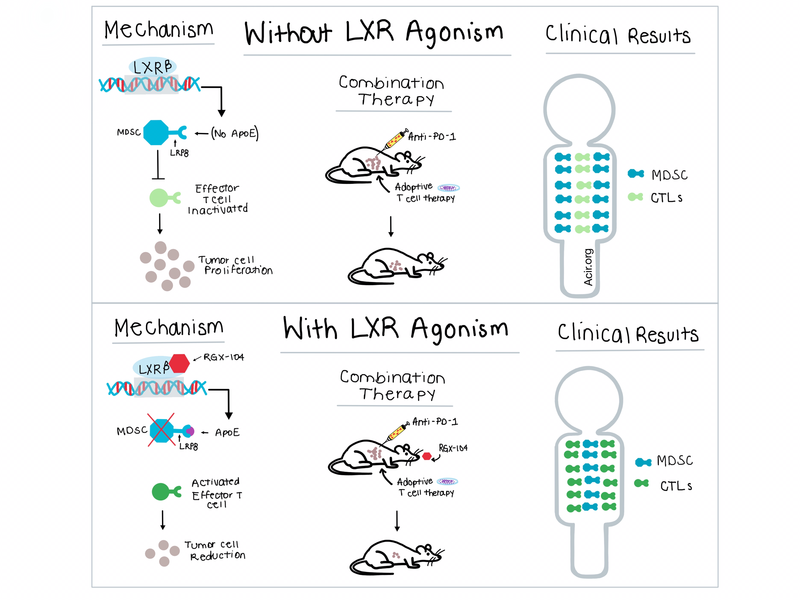 Together, these experiments suggested an immunological mechanism of LXR agonist activity. To determine the immune cell types involved, the team performed flow cytometric analysis of tumor tissue from mice with B16F10 melanoma and found that granulocytic and monocytic MDSCs were significantly reduced by LXR agonism. In addition, the MDSCs that remained after RGX-104 treatment showed less immunosuppressive activity when tested in vitro. Based on prior work that demonstrated ApoE interaction with the LRP8 receptor on MDSCs, Tavazoie et al. carried out in vitro and in vivo experiments with recombinant ApoE in LRP8-/- and wild-type MDSCs, which determined that LRP8 mediated ApoE function. This experiment highlighted the link between ApoE and MDSCs, and further experiments showed that MDSCs generated in the absence of ApoE possessed immunosuppressive activity and were resistant to LXR agonist effects on survival. In vitro, direct administration of ApoE increased apoptosis of wild-type MDSCs, but didn’t alter apoptosis of MDSCs from LRP8-/- tumor-bearing mice. Through a progressive series of experiments, the researchers were able to identify that RGX-104 increased ApoE levels, making it more available to bind to LRP8, thus depleting the MDSC population. Based on its efficacy as a monotherapy and understanding of its mechanism, the team tested RGX-104 in combination with other immunotherapies. Using adoptive T cell transfer of antigen-specific CD8+ cytotoxic T lymphocytes (CTLs) in combination with RGX-104 in B16 melanoma-bearing mice, they observed a significant reduction in tumor volume and increased mouse survival. Similarly, a combination of anti-PD-1 therapy and RGX-104 demonstrated increased antitumor activity over either monotherapy in mice with Lewis lung cancer with no overt signs of toxicity. Thus, the addition of RGX-104 led to a significant increase in the antitumor efficacy of both anti-PD-1 and adoptive T cell therapy. Combining the three treatments together resulted in a superior anti-tumor response compared to either adoptive T cell therapy with RGX-104 or adoptive T cell therapy with anti-PD-1. Even in the presence of Gvax, a vaccine known to increase the population of MDSCs, LXR agonism in combination with anti-PD-1 reduced MDSC tumor levels to that of pre-Gvax baseline, and reduced tumor growth. RGX-104 is currently being studied in a dose-escalation phase 1 clinical trial in patients with metastatic solid cancers or lymphomas who have not responded to standard-of-care regimens, and has been well tolerated with no dose-limiting toxicities. Patients were dosed orally on days 1-21 of a 28 day cycle, with peripheral blood samples obtained before dosing and at weekly intervals during dosing. Granulocytic and monocytic MDSCs levels, observed to be higher in patients than healthy volunteers, decreased with treatment in 5 of 6 patients receiving RGX-104 therapy, with no prolonged changes observed in other hematologic cell populations. Treatment with RGX-104 also resulted in a significant increase in CTL activation in 5 of 6 patients. The results of the mechanistic studies by Tavazoie et al. demonstrate that LXR agonists increase the production of ApoE, which binds to LRP8 on MDSCs to promote apoptosis of MDSCs in the TME, aiding in T cell activation. Based on these results, the clinically tested RGX-104 has potential, as a monotherapeutic agent or as part of combination therapy, to open up important new opportunities in immunotherapy. Tavazoie M.F., Pollack I., Tanqueco R., Ostendorf B.N., Reis B.S., Gonsalves F.C., Kurth I., Andreu-Agullo C., Derbyshire M.L., Posada J., Takeda S., Tafreshian K.N., Rowinsky E., Szarek M., Waltzman R.J., Mcmillan E.A., Zhao C., Mita M., Mita A., Chmielowski B., Postow M.A., Ribas A., Mucida D., Tavazoie S.F. LXR/ApoE Activation Restricts Innate Immune Suppression in Cancer. Cell. 2018 Feb 8. Understanding that T cells require cytokine engagement for optimal activation following antigen stimulation, Kagoya et al. added a truncated cytoplasmic STAT5 signaling domain from IL-2Rβ and a YXXQ STAT3-recruiting motif to a CD19-CAR construct. T cells expressing this modified CAR construct showed enhanced in vivo antitumor efficacy mediated by antigen-specific activation of the JAK-STAT pathway, which promoted proliferation and persistence and prevented terminal differentiation. McKinney and Smith provide a detailed review of the current data linking the complex metabolic profile, membrane and intracellular signaling pathways, and transcription factors together with their role in determining and modifying T cell activity and fate, particularly T cell exhaustion. They provide a clear description of the many regulators of effector and memory function needed to carefully balance an appropriate immune response. Taggart et al. created a clinically relevant melanoma transplantation mouse model with intracranial and extracranial tumors, and found that anti-PD-1/anti-CTLA-4 combination treatment (but not either monotherapy) was efficacious in the brain only in the presence of extracranial tumor and was both NK cell- and CD8+ T cell-dependent. Checkpoint blockade significantly increased the trafficking of peripherally expanded and activated CD8+ T cells to the brain via upregulation of ICAM-1 and VCAM-1, but did not induce proliferation or activation in the intracranial tumor. As T cell immunity depends critically on peptide presentation by MHC, Wei and Yewdell leave no stone unturned by compiling evidence that an alternative translational system may exist which plays a significant role in generating the peptide targets of immune surveillance. They cite multiple examples of non-canonical translation (alternative start codons, nuclear intron translation, nonsense-mediated decay) and ribosome heterogeneity (distinct subunit composition and post-translational modifications), and posit that Ribo-Seq may provide much needed clarity. To understand the biology of CD4+ cytotoxic T lymphocytes (CD4-CTLs), Patil et al. used single cell RNASeq on the CD4-TEMRA subset (effector memory T cells expressing CD45RA), which is known to be enriched for CD4-CTL. They observed significant expression of cytotoxic and survival/co-stimulatory genes and substantial but variable clonal expansion. Clustering within the CD4-TEMRA subset differentiated cytotoxic cells and their memory precursor cells, with the latter marked by high expression of IL-7R, consistent with a memory phenotype. Morisada et al. observed that in mice, high-dose hypofractionated ionizing radiation (IR) preserved peripheral and tumor-infiltrating CD8+ T cell accumulation and activation, enhanced the functionality of tumor-infiltrating T cells, reduced peripheral and tumoral gMDSC accumulation, and increased tumor immunogenicity, while low-dose daily IR caused lymphopenia and suppressed tumor-specific T cell responses. High-dose IR combined with checkpoint blockade greatly enhanced primary and abscopal tumor control that was dependent on CD8+ T cells.